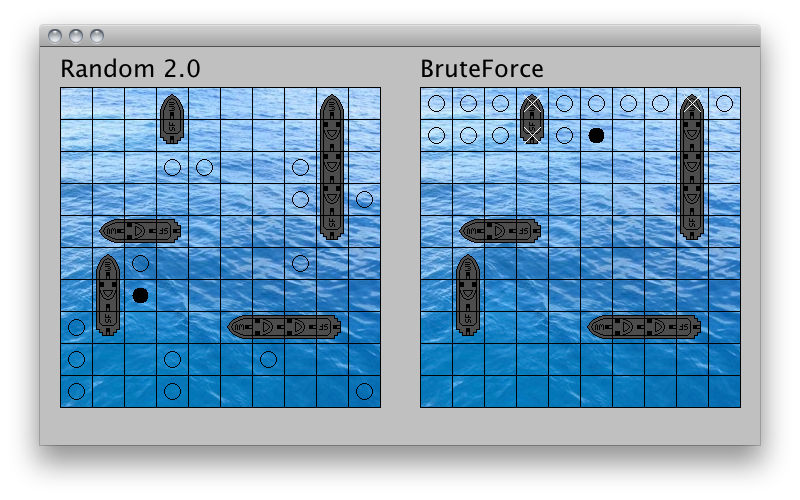 The basic idea for Over 9000 was inspired by a TopCoder marathon match, except that in their variation multiple shots were fired in a single turn and you were only told which ships were hit without knowing which shots were the hits, and board sizes could be much larger. I was curious to see how it would do and decided to implement it with a few modifications described below. For those who are interested, the problem statement can be found here and the editorial can be found here. If we look at the top left corner, there is only one configuration, so the probability is 1/7. However, the middle of the right column has probability 3/7 and will thus be more likely to contain this ship, so if we were only trying to find this ship then it would be the best place to fire. However, we have five ships to consider, not only one, and we would like to find the probability of a given square containing any ship using our probabilities for each ship. We will have to make one more assumption to do this and assume that the ship locations are independent of each other. Of course, this is not true due to the constraint that no two ships can overlap, but it does give a good approximation. If you look at the example grid, you will notice that there is a hit on ship 5, making the surrounding locations less likely to contain ship 3. 1 - (1 - p(1)) * (1 - p(2)) * ... * (1 - p(5)). Once we get the probability for each square, then we can simply pick the square with highest probability that we have not already tried and fire there. Over 9000 also includes some modifications to this strategy to account for the assumption that all locations are equally likely. This is of course not the case, especially since many people kept the original layouts sent with BruteForce or created their own. To counter this, every square was weighted and when the probabilities were computed, they were multiplied by the weights before determining the maximum. 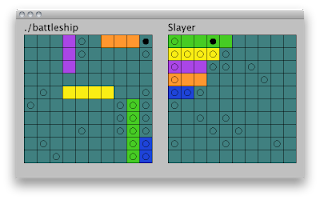 Over 9000's weight grid was based on the observation that human players preferred to place ships on the sides, and thus it gave the squares on the sides a higher weight than the others. In addition, Over 9000 added a small random number to the final probabilities, which had the effects of breaking ties and creating more interesting games, though it likely decreased performance slightly due to non-optimal behavior, as only one shot is fired at a time. However, this did have the positive effect of having no definite worst-case enemy ship placement, as Over 9000 would no longer be deterministic. There are still some improvements which can be made, however. One simple improvement is to keep track of the games you play and increase the values in your weight grid as you get hits in squares, giving better results against people who play a small set of layouts. Another improvement which can be made is to consider multiple ships at a time instead of one ship, which will help offset the independence assumption. Ideally, we would consider layouts of all ships at once instead of placing single ships, but this would of course take up too much time in the early stages of the game when there is little known information. Bob uses the same strategy, except that Bob uses only the information that a square was a hit or a miss. Also, Bob does not use either of the modifications described two paragraphs ago. With regard to ship placement, it would usually make little difference how your ships were placed as a whole, though it was often possible to look at other programs and determine the worst case placement against their program. The code for Over 9000 is attached and we highly suggest that you read it. We have commented most of the lines and tried to make it not too difficult to understand. We have also implemented a random ship placement function and we recommend you look at the coding techniques used, especially if you had trouble implementing or were not sure of how to do this. Thank you for showing interest in computer science and participating in the Computer Team elective or joining the mailing list for the past trimester. I hope you learned something new, interesting, and worthwhile from the elective, whether it be a new algorithm, that USACO is not trivial, that Battleship is fun, but even more so when visualized with fitting sound effects, that student-run electives work, or that Dr. Nevard loves dark chocolate. Most importantly, I hope you all had fun. I know that working on USACO training or listening to lectures can get quite boring; this is why we decided to do a project for the end of the year. After about a month of work on the final project, Battleship, we finally get to see the skills of each and every one of you as problem solvers and computer scientists. From reading your code to watching your programs battle each other on screen, we have gotten a fairly good estimate of your skills in a real-life task. My expectations were in line with the tournament results. #NONAME (Alex Zhu) was not entered because it was less than 50 lines long. Alex Zhu was disqualified by teachers' discretion. His program just shot at cell `A1'. Zumwalt Mk II (Jonathan Beekman) was not entered because some opponents' ship placements caused it to hang. Ari Jidai (Jonathan Sorce) was not entered because some opponents' ship placements caused it to crash. Congratulations Jie Guan for winning the first annual Battleship Tournament! Also, props to Andrew for putting up a tough fight. We will be sending out an explanation about Over 9000 in the near future, by popular request. Again, thank you all for participating in the tournament and in the elective. We hope you found it to be interesting and more helpful/fun/challenging than your normal computer science classes. I won't be sending out many emails from now on; I expect one or two more regarding the future of Computer Team. Enjoy the remainder of the year! Wow! It has been a great first year for BCA Computer Team. You all deserve a big pat on the back for shaping the elective into what it is now and deserve many thanks for your involvement and contributions. Hopefully the elective has fulfilled its intended purpose: to present challenges in computer science to further current knowledge. Please do not feel discouraged by USACO training and the contests, they were meant to be tough and non-routine. 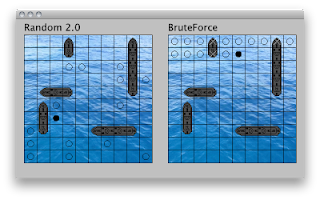 Battleship was meant to be a relaxing break from the training problems; hopefully it was a good application of algorithmic programming, data structures, and most of all, problem solving in a real-life programming job. The real lesson to be learned from CompTeam is to create opportunities for yourself. Don't complain about the teachers; just finish their work quickly so you have more time for your own endeavors. There is a plethora of fresh material waiting: USACO, TopCoder, research, and even projects. The last option is most definitely possible. I'll give you two examples. At the end of junior year, I wrote a minesweeper clone, LOLsweeper, in two days using Java. This year, Mark Fayngersh, Alec Benzer, Vikram Jayashankar, and friends wrote a full-blown iPad game, Blob Defense in about a month using Objective C. Sure, this sounds intimidating at first, but if you are willing to take the time to learn cool techniques, languages, and coding paradigms, you most certainly will get a phenomenal product and you will be impressed at what you are capable of. So when should you start? NOW! Last but not least, since the elective is in its infancy, I would like to present my expectations for CompTeam's future. I will officially empower Alec Benzer as 2010-2011 Captain at 12:00PM on 24 June 2010. This does not imply that he is the one doing everything, though he is the one managing logistics. Remember that this is CompTeam; it has been successful for the past year because of you, the individual. My stepping down means that I will not be dictating the future of CompTeam. Keep the team alive, make it a tradition, and hopefully it will be recognized as a competent team. Attract freshmen and everyone who wants to pursue computer science or wants a challenge in problem solving with computers. Do a mixture of lectures, contest problems, and projects. Host a game tournament, party, and give out prizes. Share lectures, material, knowledge and put them on a website or central repository. Get parents involved. Learn. Have fun. Make new friends. I must reiterate myself again: don't let teachers limit your potential. Reflect on the accomplishments you made in CompTeam. That was all you. If you realized that compsci isn't your passion, keep looking. As Steve Jobs said in his Stanford Commencement speech, "Don't settle until you found something (or someone) you love. As with all matters of the heart, you'll know when you find it." While the contestants were working on their programs, Sam and I worked on the Visualizer. We decided to work in a linear fashion, which probably was not very efficient. Then again, neither of us felt like writing an API or outline. We agreed that Sam would take care of the underpinnings and I would do the graphics and interface. Sam started out with a backbone from another TopCoder visualizer. He slowly built upon it, changing, adding, and deleting functions as necessary. After a week's worth of work in class, during frees, and at home, Sam had a program that displayed the ships as colored blocks. We showed this on 28 May 2010 and wowed the class. BruteForce, Random 1.0, Bob, Over 9000, Slayer (Nick), and ./battleship (Alec, Mark, Vikram) participated. We were confident that people were awed by how fun the Battleship tournament would be. Following that Friday was Memorial weekend. This was basically my only free time to substantially revamp the program. 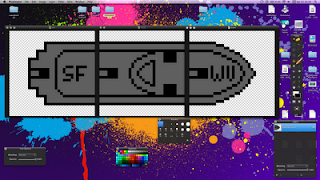 Coincidentally, I received my beautiful Dell Ultrasharp U2211 21" screen, of whose widescreen-ness I took advantage to do the graphics for the ships. Sound effects were secondary, since those could be trivially found on the internet. I settled on a frog croak and glass breaking. After about a day's worth of work, I can say that I have made some progress. I then sent the two screenshots to two folks, who then gave me comments and suggestions. Both of them thought it was phenomenal compared to the original. One of them suggested using a top-down view instead of a perspective view of the ocean. In the meantime, the competitors kept on working on and sending me their programs. Sam assisted me in debugging and critiquing programs. He almost cried as he read through one of the programs I received. We showed demos every Tuesday until the 15th of June, since neither of us would be present in class on Fridays. 4 June 2010 was ARML and the Friday after that was afterprom. In addition to the 15th being our last day of class, I decided to have a party for celebrating the end of one year for Computer Team. After two more demo days, the contestants were confident that their programs would fare well in the tournament. After half a year, I finally finish USACO training section 2.4. FINALLY. This has pissed me off for the past six months. And no, I haven't done anything about it until now. Actually I did, but those efforts were futile. When I decided to do three problems in fifteen hours. Hello USACO training Chapter 3! Darn this probably reflects on my insane perseverance for random things. You do not know the location of your opponent's ships. Every turn, you will output a location to fire at, and you will be told whether your shot was a hit or a miss, and if it was a hit, which of your opponent's ships you have hit. The first person to sink all of their opponent's ships wins. There will be a round-robin tournament, where every program will play all other programs k times, for some integer k to be decided. Programs will be awarded 1 point for each victory and 0 points for each loss and will be ranked on how many points they receive. If neither program has won after each program has had 200 calls to fire, no points will be given to either program. If you are writing your code in Java, then your files should all be contained in one package which is not the default. If you are writing your code in another language, then compile your code to an .exe file. It is ok if your program requires other files in the same directory. Each program will be placed in its own folder, and no program should try to access files in another folder. Programs may create or modify files in their own folder if desired. Prints the name of your program to standard output and flushes the buffer. Prints a string which represents the locations of your ships and flushes the buffer. Your string will consist of 5 pairs of points which describe the endpoints of each ship, in order. For example, the grid above would be represented by "F9 J9 E4 E7 A4 C4 A7 A9 H4 H5". Ships must be placed horizontal or vertical, must be completely on the grid, cannot overlap, and must have lengths consistent with the table in order. Failure to do so will result in a forfeit for that match. Extra spaces in the output string will be ignored by the parser. Prints a string which represents where you would like to fire and flushes the buffer. The string will be of the form (row)(column), just like above. For example, to fire at B4, print the string "B4". An incorrectly formatted output or out of bounds output will result in a forfeit. Extra spaces in the output string will be ignored by the parser. n will be a number representing the index of the hit ship in the above table, or 0 if no ship was hit. 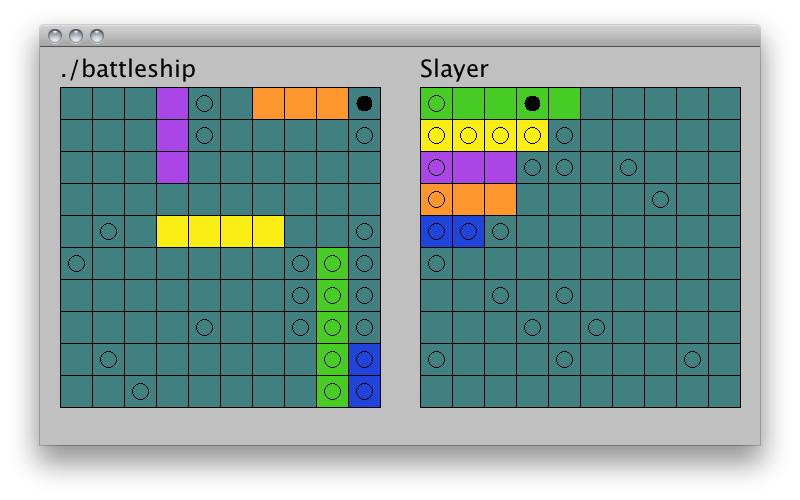 For example, if n = 2, then you hit your opponent's battleship. Your program should process this data however it likes. - After every call to fire, there will be a call to hits, even if your program has already won. After this, if a program has won, both programs will be told to exit. - Your program cannot get a hit on a square multiple times. If your program fires on a square more than once, it will always be a miss. - Please test your code before you send in your final version. The competitors seemed pretty excited about it. I also opened it to anyone remotely interested (aka people on my mailing list). For the first few classes, I let them work on their programs. As expected, they got a bit bored on the second or third class. 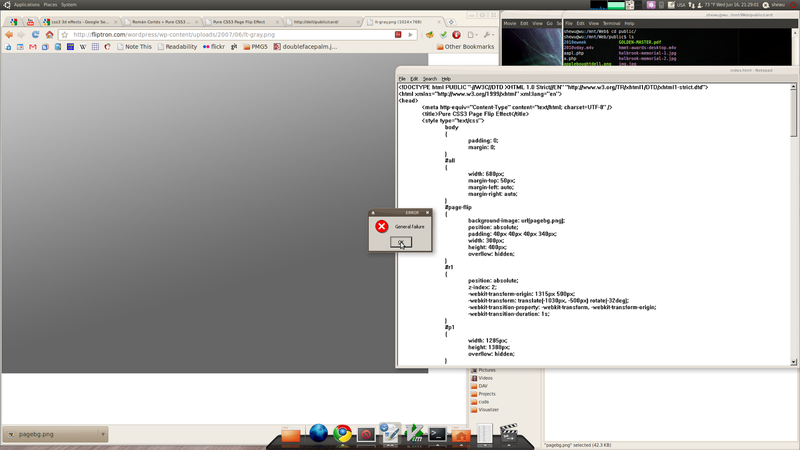 When I tried to save a file in Notepad under WINE, I got the following error. I thought this was pretty hilarious. Today marks the date of the 2010 refresh of Apple's diminutive computer, the Mac mini. The computer was introduced back in January 2005, at the annual MacWorld conference, from which Apple defected four years later. The first generation of the Mac mini was also my first OS X-era Macintosh; the other Mac I have at home is a 1990 Macintosh Classic from the days of my dad's graduate studies at Princeton. The Mac mini served as Apple's lowest-end machine, used to woo Windows users to the land of Apple. Current Mac users used the machine for home theater purposes or as an addition to their current Mac family. Either way, it was priced at a tempting $499 (Intel machines started at $599). It was a really small and cute computer, but by no means powerful. My machine was equipped with a 1.25GHz RISC processor, 256MB of memory, and 40GB hard drive. 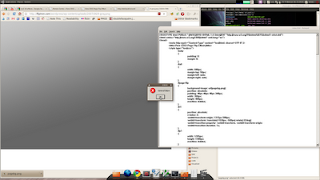 However, it served as an excellent introduction to Mac OS X and the rest of the UNIX and digital media creation world. It was on that computer that I experimented with video editing, photo organizing, and website building. Fast forward five and a half years. The Mac mini has evolved into a beast since the Intel transition. The current machines are at least twice as fast, if not more. They have a dual core processor, plethora of memory and disk space, and a much faster graphics subsystem. Any Intel Mac mini could whip the G4 back into its stable (when running processor-native software, that is). Today's machine is equipped with a 2.4GHz or a 2.66GHz Core 2 Duo, 2-8 GB of RAM, 320 or 500GB disk, and a Nvidia 320M integrated graphics chipset. These specs are identical to those of the MacBook Pro 13". Unlike the MacBook Pro, the new Mac mini got a chassis revision as well -- surprise! No one expected the spanish inquisition a smaller, thinner, unibody chassis with a removable cover! This is perhaps the biggest upgrade the Mac mini could have received. Previous, to open the chassis, one had to pry the main unit from the aluminum and plastic chassis with a putty knife. The new unit has a round, plastic cover on the bottom that not only is the base of the machine, but also doubles as the port from which the internals of the machine are accessible. The machine now features an integrated power supply, which means that it does not require a ginormous power brick to power the machine. Additionally, Apple subtracted a USB port, but added an HDMI port for home theater purposes. An SD reader sits on the rear of the machine for easier photo downloading purposes. Also of note is the lowered power consumption. The machine comes with a 85W power supply instead of a 110W unit from the previous Intel units. At idle, the machine sips a measly 10W, making it one of the least power-hogging consumer desktops available. Today's announcement is not all good news, however. The price of this entry-level machine hiked northward of $100! This was, too, unexpected. Why would Apple increase the price of their already expensive low-end machine even higher?! All for the upgraded internals and the stunning unibody enclosure? Who knows. Unsurprisingly, the $999 server version did not receive much fanfare. It includes a 2.66GHz processor, 4GB (upgradeable to 8GB) memory, and 2x500GB disks. To me, this is, hands-down, the best better value Mac mini (there are only two Mac mini models this time). I would even go as far to say that this is the best value Mac for me; it comes with an easy-to-use UNIX based server grade operating system without a tremendously bulky case or high power consumption. By stating my preferences, I am placing value on the tiny enclosure and its energy efficiency, which many people overlook. Of course, many people would rather have a large desktop machine for expandability purposes and easy servicing; that is their preferences. I do not know what everyone else wants; I only know what is best for me. Overall, this is a great computer for anyone looking for a small, efficient, and pretty desktop machine for low to medium powered computing tasks. It should be great for playing 1080p video or some light gaming; it certainly will not handle anything intense. It is also recommended for anyone who needs a light to medium duty web server without extraordinary data storage requirements. I strongly recommend the server model over than the `consumer' model; you would get a much more powerful computer at the same price or one with the same power at a much lower the price, given that you do not mind a louder, bulkier, and more power consuming computer. AN: Because it's getting a bit late and my conscience is telling me to write Battleship, I'll try to make it decently to the point. Friday was the start to everything. I left two hours later than the school since parents were driving me, but arrived at Penn State only twenty minutes later. I lent my PS/2 to USB converter to Alex Kim so he could use his keyboard to play starcraft, touched base with Dr. Mayers and Dr. Abramson, and then hung out with Jenny Yung for most of the day. We went to the creamery, walked randomly for about a mile, and then ate my quiche after my team meeting. Then I met some of the TJ friends. They're definitely not as nerdy as Pavel or Ian, not as antisocial as Sam, and not as random, brash, or unpredictable as me. I stayed till 22:00 for the song contest. Mark's troupe made a phenomenal showing, but Lehigh out-cheered us with their army of high-pitched girly screams situated in the front row. In any case, everyone who saw our performance should know that the Catalan numbers have the form `one over n plus one two n choose n' and are used for `trees, walks, and cut-up blocks.' Yep, those are partial lyrics from our song, a parody of `I'll make a man out of you' from Mulan. :D Unfortunately two other teams decided to do that, but they failed. That concludes day one. Saturday was the day of the competition. The problems were harder this year and mostly everyone did worse than usual. They had nice tricks to them, but I failed to arithmeticize properly. Three people, John Chiarelli, Jongwhan Park, and Michael Tan, received high honors for scoring 7/10. We (AAST A1 or informally Mu A) got ninth, our second best finish in the team's history. Yay :D (We also were first to hand in an answer for the super relay, but failed because Ian, the middleman, explozored. Ah well. :( no candy for us XD) At the end of the day, while everyone was walking to the buses, I spotted Jenny from behind and tackled her :D Yay momentum conversation conservation! Then I went home with parents. In any case, this was a spectacular finish for Math Team 2009-2010.